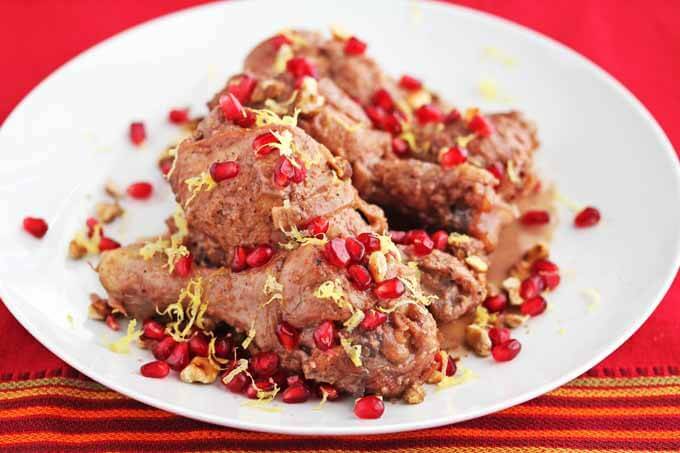 Braised Pomegranate Chicken with Walnuts is a Persian dish with a rich creamy nut sauce. This dish is also known as Fesenjan. Recently, my husband and I were treated to a traditional Georgian feast, and I mean feast! When my husband first told me about this special Georgian get together, I naively thought he meant Georgian as in the state of Georgia. Then, I realized it had to be sometime different, something I had never experienced. And let me tell you, it was definitely one of the most entertaining and fun nights I’ve had in a long time. Little did I know that it was the Georgian New Year’s Eve that evening, which falls on January 14th of each year. We were seated next to a very long table of local Georgians who entertained us all night singing traditional Georgian songs, performing Georgian dances (the guys can get down really low! ), and toasting the night away (Georgians are a happy people who toast a lot and stand on their chairs when they toast). I just love observing the traditions of different cultures. And the food? Well, let’s just say that when our host, who is Georgian, said he was basically going to order the entire menu, our jaws dropped. The 12 course authentic Georgian feast we were treated to was awe-inspiring, with walnuts playing a major role in practically every dish. There were spinach walnut balls, red kidney beans in walnut sauce, eggplant with walnut, chicken with walnut, dates with walnut, almost anything with walnut. I left that evening so excited and inspired by this magical evening with our generous hosts (the free entertainment from our neighboring table didn’t hurt), that I became obsessed with learning more about Georgian cuisine, and namely, all Georgian dishes made with walnuts. For those of you who don’t now where Georgia is (I was one of them), Georgia straddles Western Asia and Eastern Europe. To its west is the Black Sea, to the north is Russian, to the south are Turkey and Armenia, and to the east is Azerbaijan. 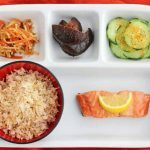 So, Georgian cuisine is influenced by Russian and Middle Eastern cuisines. What intrigued me about the dishes from that evening was that walnuts were used as an integral part of each dish, not just as a garnish. Sure, I’ve tossed walnuts in with banana bread or on top of muffins. I throw them on top of hot breakfast cereals, salads and soups regularly too. But, I’ve never really cooked with walnuts, where walnuts are the star of the show. I did a little more digging and found that walnut sauces are used in lots of Mediterranean foods, including Turkish Tarator (a walnut and garlic sauce), Italian Sugo alle noci (walnut sauce served with pasta), and a Persian dish called Fesenjan (a pomegranate walnut chicken stew). Given how widespread walnut sauce is used, I can’t believe I’ve never come across it before. Given my recent obsession with walnuts, I knew I had to try making this Persian Braised Pomegranate Chicken with Walnuts recipe when I spotted it in edible: A Celebration of Local Foods, a cookbook by Tracey Ryder and Carole Topalian. 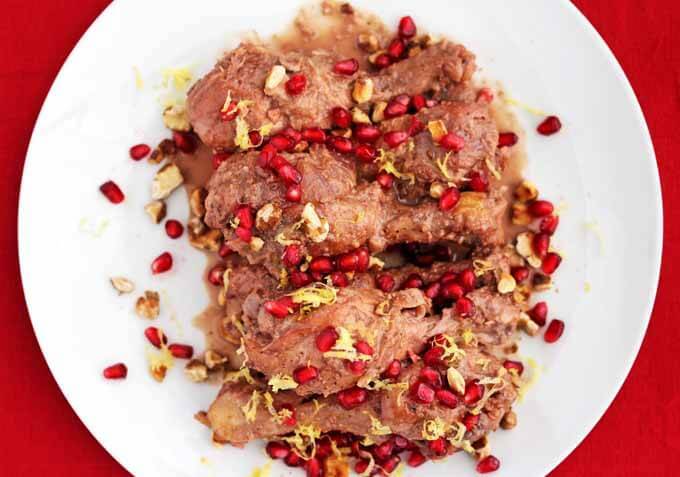 Known in Iran as Fesenjan, this Pomegranate Chicken with Walnut dish is considered a special occasion dish and is supposed to be thick and rich, with a sweet and sour flavor. Sometimes made with pomegranate molasses, or this case, pomegranate juice, the gravy relies on ground walnuts for its thickness. Since I’ve been experimenting a lot with walnuts in savory dishes recently, I was especially curious about the amount of walnuts used in the recipe as the headnote mentions that the sauce is quite thin, and that more walnuts can be added for a thicker sauce. As I researched other recipes for Fesenjan, I found that most recipes use a 1/2 pound or about 2 cups of walnuts, a lot more than the two tablespoons called for in the recipe I was trying. I decided to meet halfway by using 1 cup of walnuts as I felt 2 cups was a lot of walnuts. The Walnut Sauce was a bit liquidy before I reduced it further. When I first photographed this Pomegranate Chicken with Walnuts dish, I plated the chicken as it came out of the pan, but I wasn’t too happy with how liquidy the sauce was, so I decided to reduce the walnut sauce further. The result? I loved how rich, smooth and thick the sauce turned with a bit more cooking time. The sauce actually became darker too. After thickening the Walnut Sauce, it became creamier, richer and deeper colored. When the kids asked what was for dinner, I gave them my pat response, “chicken.” “What kind of chicken?” they pressed. “Chicken with kind of a sweet and sour sauce.” I didn’t want to say walnut sauce for fear it might cause eyeballs to roll. Sometimes less information is better until the ultimate taste test…my little guy loved the sauce and asked for extra, and the older boys mopped up the walnut sauce with their rice. I served this Braised Pomegranate Chicken with Walnut Sauce with Scented Saffron Rice and Roasted Cauliflower “Gratin.” I’ll be sharing the Scented Saffron Rice Recipe soon, and the Roasted Cauliflower “Gratin” was simply my go-to Roasted Cauliflower recipe sprinkled with Mary Gone Cracker’s Gluten-Free Breadcrumbs. Today, a group of food bloggers is celebrating Tracy Ryder and Carole Topalian among the 50 Women Game Changers in Food. Although I have to confess that I’d never heard of either one of these ladies, I have several of their Edible publications in my possession, including edible Hawaiian Islands, edible Blue Ridge, and edible Nutmeg. Ms. Ryder and Topalian “champion the idea that local seasonal food is good food.” They co-founded Edible Communities Publications, a network of 65 regional food magazines that celebrate a collection of local food throughout the U.S. and Canada. Their first book, Edible: A Celebration of Local Foods, celebrates local food heroes and traditions in North America, highlighting local foods from farmers, artisans, chefs and organizations that make a difference. Their goal is to “transform the way consumers shop for, cook, eat and relate to local food.” I love the concept that these two women have come up with, and the national impact they have had in promoting local foods. 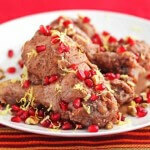 If you like sweet and tangy, you will love this Pomegranate Chicken and Walnut dish. Don’t let the walnut sauce throw you. It is so rich and creamy that you will think it has to have butter and cream in it, but it doesn’t. 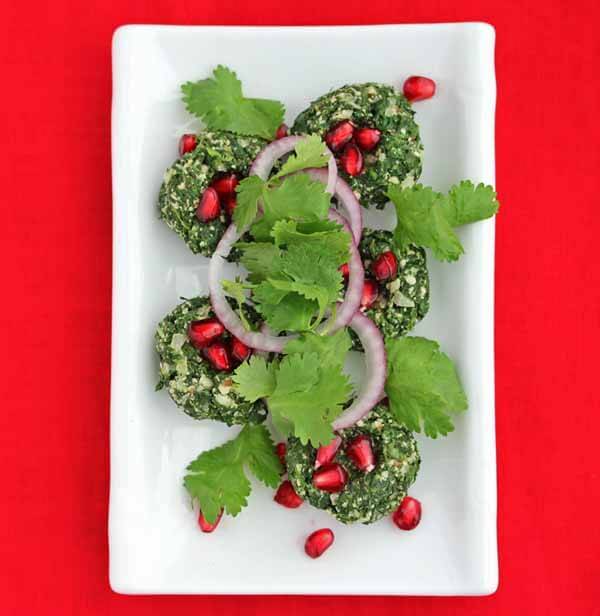 You must top this dish off with pomegranate seeds – while flavorful on its own, it is a brown dish, so adding some color and pop to it makes it visually much more appealing. Adapted from edible: A Celebration of Local Foods. The original recipe came from Edible East Bay's (California) editor, Cheryl Koehler. Heat oil in a large skillet over medium heat. Place chicken pieces in pan, single layer, making sure sides of chicken pieces do not touch. You want the chicken to brown, not steam. Brown all sides of chicken pieces nicely, about 4-5 minutes. You may need to do this in two batches depending o the size of your skillet. Remove chicken to a plate. Add onion to pan and cook on medium-low until golden brown, about 7-8 minutes. Do not burn. Add garlic, cardamon, and cinnamon and cook, stirring continuously, for one minute. Add ground walnuts and cook, stirring often, until toasted, about 2-3 minutes. Stir in pomegranate juice, lemon juice and lemon zest. Cook for 2 minutes, scraping up brown bits from the bottom of the pan. Return chicken pieces to the pan and spoon some sauce on top of chicken. Bring to a oil, then reduce heat to low and simmer, covered, for 30-35 minutes, until chicken is cooked through. Remove chicken from pan and cover to keep warm. Reduce walnut sauce until it reaches the desired consistency. Return chicken to pan and coat with sauce. Before serving, sprinkle chicken with toasted walnuts, pomegranate seeds and lemon zest. To make a thicker, creamier sauce, I increased the amount of walnuts in the recipe from 2 tablespoons to 1 cup. I also made a few modifications to the cooking technique. The original recipe adds the ground walnuts at the end of the cooking process. 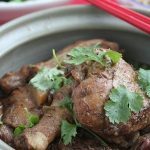 I chose to follow the traditional method of cooking the ground walnuts with the onions until browned (deepening the flavor of the walnuts), and letting the nuts braise with the chicken from start to finish. I also took the extra step of reducing the walnut sauce at the very end for a thicker sauce - it's really a matter of preference, depending on whether you like a thick or thin sauce. I ended up with a creamy, thick sauce with no little walnut pieces floating around. I just love the brightness that the pomegranate and lemon zest add at the end. This sounds like a thoroughly comforting dish! Thanks Heather – the pomegranate seeds and lemon zest definitely brighten up this otherwise brown chicken dish. The walnut sauce was incredible. I once made a bread from Georgia that is flat and stuffed with cheese. The best!!! 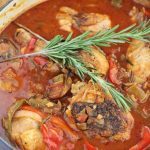 This Georgian inspired dish sounds incredible too!!! Yes, bread stuffed with cheese is very big in Georgian cuisine. We had some at our dinner and it was decadent! I’ve only made fesenjan with pomegranate molasses, which aren’t molasses at all but have that same consistency, and that has made for a thick and glaze-like sauce. You can make your own pom molasses by boiling down pomegranate juice to one-fourth of its original volume, or buy the molasses in a Middle Eastern market. Try duck fesenjan, too. It’s lovely. I actually have pomegranate molasses in my pantry, so next time, I’m going to try making this dish with it instead of the pomegranate juice. 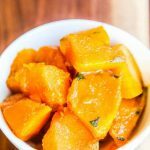 I am completely taken with this recipe, I love sweet and tangy flavors, and all your changes seem right on. I can’t wait for the saffron rice recipe! 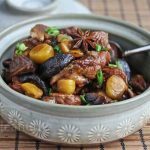 Thanks Sue – I spent some time researching recipes for this dish and found most of them had a significant amount of nuts. I think the edible recipe was meant to simplify the recipe perhaps. Since I wanted to make a more traditional version, I added more walnuts and cooked them with the chicken from beginning to end. This looks so tasty and the pomegranate seeds are gorgeous! Love this post. I love fresh pomegranates arils and learned something new about a dish native to Georgians. I grew up in a town with a large Georgian community arrived in Israel mostly in the 70s. Love their fruit leathers. Sounds like a feast!! Fruit leathers – now I don’t know anything about that but will have to ask my Georgian friend next time I see him. Your Circassian Chicken sounds similar to the Chicken with Walnut dish we had at the Georgian restaurant except the Georgian version does have any bread in it. I do it fascinating how Chicken with Walnuts can be found in so many variations in that region of the world. It makes sense, of course, but I would love to just sample my way around that region. Adore using walnuts in cooking. But have never used as many as the Georgian Feast! 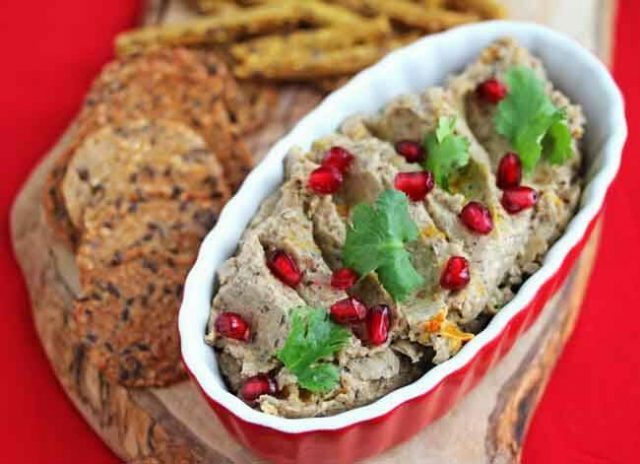 The idea of walnuts and pomegranate really resonates – so pretty and so many lovely flavors. A vibrant and delicious dish. I love all the flavours. I love the idea of a walnut sauce on chicken ~ must try this. Whenever I can I love to fit nuts into a meal. The pom seeds are nice for pop & a hint of sweetness too! 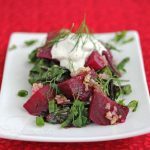 The walnut sauce is really rich and creamy – I am obsessed with walnut sauce and walnuts (and pom seeds) right now after that Georgian feast! Oh my god, what a meal! I’ve actually had this dish at a persian restaurant before and it is AMAZING. The walnuts make for a miracle sauce, that’s for sure! You are a lucky girl – I would love to back to that Georgian restaurant and try some more dishes. 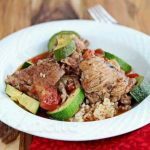 Jeanette, This looks so good…the pomegranate sand lemon zest add to the dish visually and the walnut sauce sounds delicious. I will definitely try this next week. I really enjoyed your story today. I have never used walnuts this way, but toss them ON a lot of dishes. I think I will follow your advice and not tell my kids that it’s walnut sauce…until after dinner! Thanks Annie, hope you enjoy it. I do think sometimes less information (at least until they get the first bite in their mouths) is better. You picked a wonderful recipe for your game changer. You can never go wrong with chicken. Thanks for sharing with us. Chicken and pomegranate is a wonderful combination.All the more intriguing because it is somewhat exquisite,one does not hear about pomegranate chicken at every restaurant.Here in India,in the Lucknow region,they do a dish with chicken and pomegranate juice too. How interesting, I would love see how the chicken and pomegranate juice dish in Lucknow is made. Thank you for introducing us to Georgian Cuisine (I did not know where it was either), but also for the introduction of Carol and Tracey. I had not heard of them or their mission. I’ll have to look into some of the publications you’ve mentioned. The pomegranate, lemon and cardamom sounds like an amazing way to flavor chicken. Beautiful. I…really want this right now. Chicken, pomegranate, and walnuts. 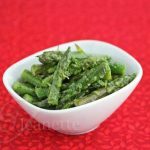 An interesting combination but, hey, if it’s good, then it’s a must-try recipe! As I did a little more digging, it was so interesting to find that walnut sauce is used in a lot of different ethnic cuisines. I had just never come across it in the U.S.
i’ve never heard of georgian cuisine, but i love how walnuts is the central ingredient! how healthy! 😀 this dish looks delicious. walnut reduction sauce sounds so good. have a wonderful day! Yes, walnuts are healthy (although if I ate that many dishes with walnuts every night, the calorie count and fat would definitely add up ;). Walnuts are considered a near perfect food, in particular the “English” or “Persian” Walnut. I have come to love them more and more and I have two gigantic Walnut Trees in my orchard which produce many. Protein wise, I read, that one pound of walnuts is equivalent to 8 steaks. Now, if I can just get myself to start producing Walnut Oil, I could become wealthy for it sure is expensive at the store! Can’t wait to try that recipe! Thank you, Jeanette! I know this dish as Khoresh-e-fesenjan. When I was only 10, my Dad was AF stationed in Teheran (1958) and the military driver assigned to us was an avid duck hunter. So was my Dad, so they really enjoyed going hunting. Duck Fesenjan was Reza’s favorite way to fix duck! He cooked it for our family more than once. Mmmmm. Your recipe brings back such fond memories of this flavor. 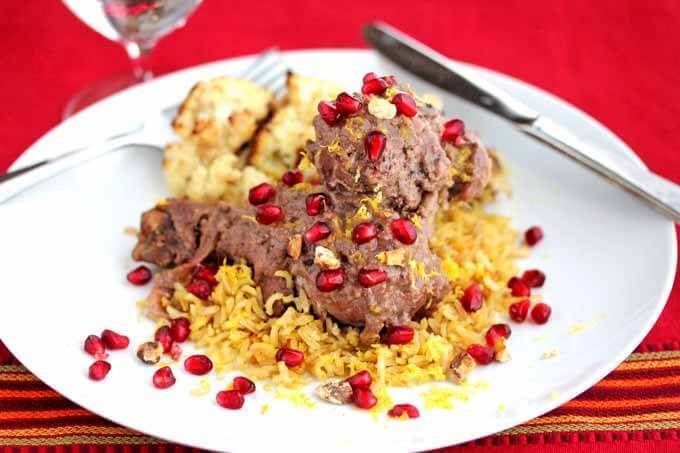 My recipe is similar, with the traditional fesenjan pomegranate/walnut braising. Of course, an Iranian will tell you ONLY with Iranian rice will it truly be a good fesenjan. 😉 Truly a unique, nutty flavor in a sea of world rices out there. It was SO good my folks brought back 250# of it packed in a metal drum in their household goods! It kept, with dessicants, for 8 years or so! Nothing like Iranian rice in all the world IMO. Closest thing to it is Afghani rice, which I’ve had the pleasure of tasting once, but here in the States, imported basmati is as good as you will find that comes close to it. Oh Yeah, this is an awesome recipe. Just finished eating it and it was soooo good. Thank you! Thanks Marry – so glad you tried this and enjoyed it! Thanks so much for coming back to let me know how it turned out.